How does alcohol affect the brain? 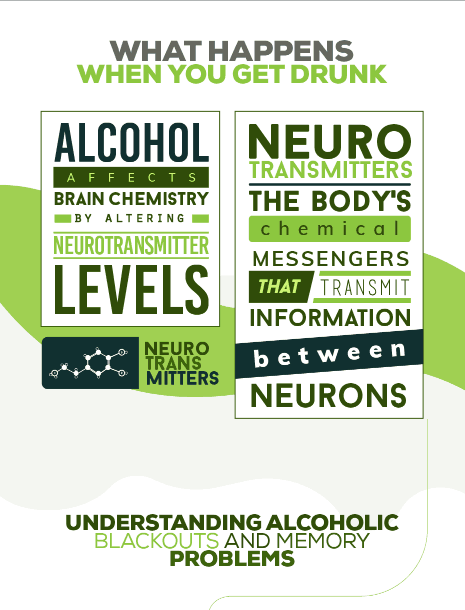 Many people drink, yet don't really know what the chemical reactions are in the brain. Most know that when you drink too much you end up getting buzzed, tipsy and/or drunk. This infographic by NorthPoint Washington goes over why this happens. The effects that alcohol has on the brain frequently go underdiagnosed. Heavy consumption, over long periods of time, has serious reproductions in various body parts including the brain. Some of the damage may be irreversible. - Unconsciousness or coma from alcohol poisoning. - Damage to the GABA neurotransmission system, which is known to be involved in mental disorders such as depression and anxiety. - Myriad problems, such as problems with learning, memory and basic motor skills. - Altered mood, sleeping ability, and even the way you experience temperature fluctuations.